A lot of the material in this piece discussed the economic crisis of 2008. Taylor particularly cited the culture of corruption and greed among some players that caused the calamity. The author describes feelings of distrust and financial loss. Many people lost what they had invested in stocks and real estate. The number of home foreclosures and economic uncertainty was at its highest level in history. I remember this time well because I lost a business and a home, and I remember how people’s fears were palpable. I also remember that information about what had happened was slow to surface. Without question, it seemed as though we had all been the victims of some very questionable practices by some in the investment banking industry. The word was that often these folks operated with a total lack of integrity, and this brings us back to Helane Morrison. Ms. Morrison began her career serving as a law clerk for first, the Hon. Richard A. Posner of the U.S. Court of Appeals for the Seventh Circuit (1984-1985), and then for Supreme Court Justice Harry A. Blackmun (1985-1986). Since entering private practice, she has been responsible for monitoring, litigating, and enforcing SEC violations in several different, private and public positions. 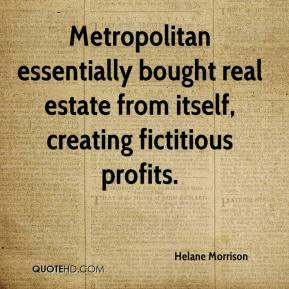 Learning about Helane Morrison and her career got me thinking how much safer our financial sector, economy and country would be with more people like her. The economic crisis hurt millions of people. I for one feel better because someone like Helane Morrison is on the job. Perhaps a new cabinet position Mr. President?